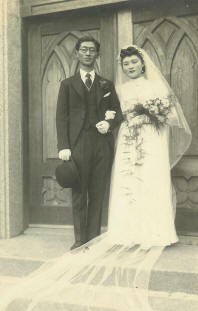 My wife Helen（劉慶理） was born in Tainan on October 30, 1923 in the household of Liu Ching-yun(劉青雲). Mr. Liu was one of those very select few to obtain a bachelor of economics degree from Keio University. Upon the arrival of his first daughter, the proud father named her Ching-li (慶理), taking one character each from the name of his college 慶應 and his degree 理財學士. Helen’s mother, a Japanese, Honme Tei（本目貞）, came from a family of Hatamoto （旗本）who in olden days were vassals placed under the direct command of the Tokugawa shogun. The Liu clan was prominent in Tainan and played a leading role in Christian circles. 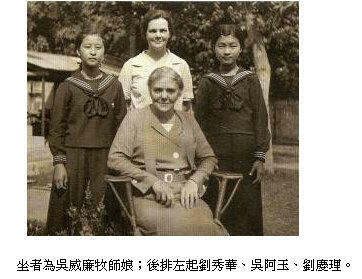 In Colonial Taiwan, Helen attended schools established primarily for Japanese children. 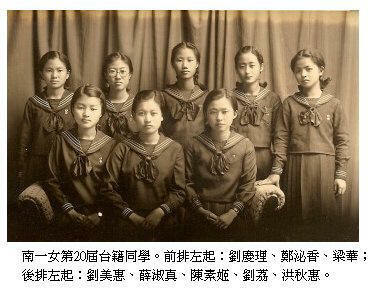 When she entered Hanazono Kindergarten in April 1930, there was only one other Taiwanese among her classmates. In Hanazono Primary School, there were two, and in Tainan First Girl’s High, there were seven. During her Grades 5 and 6 years, Helen studied piano under Mrs. Margaret Mellis Gauld (1867-1960), a minister’s wife. It was rare for Tainan to have a master teacher of her caliber. (It so happened that her daughter Greta was head of the nursing staff at a Christian hospital in Tainan at that time.) Aware of the opportunity presented to her, Helen practiced diligently, and a Steinberg Piano purchased from Berlin became her constant companion..
On February 10, 1935 Helen was baptized by the Rev. Inoue Taichi of Tainan Methodist Church. In April 1940, Helen went to Tokyo to study at the Women’s Division of Aoyama Gakuin University （青山學院）, her mother’s alma mater. The required Bible course was taught by Prof. Sakon Takae (1906-1977) who was American trained. Helen majored in Home Economics. In addition to Home Economics, Sewing, and Cooking required for her major, she studied Japanese Literature, Ethics, Logic, Psychology, Physiology, Biology and Music. The course of study normally required three years to complete, but the wartime exigency shortened it to two and a half years. Helen graduated in September 1942. The following March, she received a certificate of license to teach in boys and girls middle schools. Upon her return to Tainan, Helen was tutored by her paternal grandmother in how to speak Taiwanese. For a brief period of time she worked at Tainan’s Weather Observatory. On March 1, 1945, the city of Tainan was devastated by a massive air raid. Helen’s parents decided it was time to take shelter in the countryside. Space in the rural area was at a premium. The parents rented a room in a tenant’s house, but Helen and her youngest brother Percy had to be placed with the family of their great uncle in the Nanhua Mountain District （南化山區）. Percy was still at a tender age, and it was Helen who cared for him. The family was not reunited until after the end of the war. After the war Helen and John were properly introduced to each other by the Methodist minister, the Rev. Nakamori Ikunoshin（中森幾之進）. With Mr. and Mrs. Yang Chi-quan (楊基銓 Mrs. Yang was an aunt to Helen), as the go-betweens, their marriage took place on December 26, 1946 at the Chun-shan Presbyterian Church in Taipei （台北中山基督長老教會）with the Rev. Duncan MacLeod officiating. The two were joined together for close to 65 years while “love deepened day after day.” Helen was a wise and virtuous lady who with all her heart and mind sustained her family. She was pure in spirit, tender-hearted, and kind and always treated others with sincerity and compassion. Whenever she saw someone in need, her purse string was cut, as she found joy in helping others. She loved classical music, flowers and plants, Japanese television, reading and painting. She missed her homeland Taiwan as well as Japan’s beautiful sceneries. Trips to Norway, Western European countries, Mediterranean, in and out of the United States and Canada were all memorable, but none could surpass the joy of being in the Holy Land in the Millennium Year. Throughout her life Helen loved the Lord passionately. Her faith was solid. During her college days, she was deeply influenced by Uchimura Kanzo’s Non-Church Movement, but never left the organized church. After the WWII, for a time she took interest in the activities of the Assembly Movement (召会). However, once in the United States, she chose to become a member of the Boston Taiwanese Church, participating fully in its faith based activities. Every morning and night she read the Bible and prayed without fail. She loved the Japanese Bible and Japanese songs of praise. During the last several years, the couple read the Bible together and discussed it. Their routine was one chapter from the Old and one chapter from the New Testament. They might also add reading from Takahashi Saberio’s works, or いのちの水 (Water of Life) etc. Late in life, she became hard of hearing, and could not listen clearly to what her husband read. Thus the routine was changed to let her read the text, with the husband listening in. This year in September, the last chapter she read was the 21st Chapter of the Book of Revelation. Her husband John is a graduate of Tokyo Imperial University. After returning to Taiwan, he served briefly as a lecturer at the newly established private Yanping College. At the National Taiwan University, he first served as head of the Readers’ Service department of the University Library. He was one of the founding members of the University’s Library Science Department within the College of Arts and Literatures, and eventually became its professor and head. In 1972 he migrated to the United States to assume the Deputy Librarian position at the Harvard-Yenching Library. He retired in June 1996. While in Taipei, he was an elder of the Hoping Presbyterian Church. 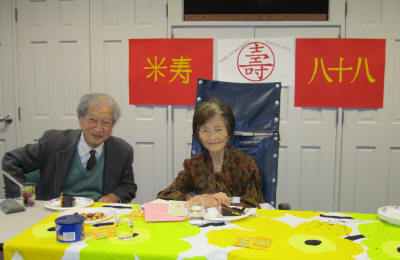 At present he is an elder emeritus of the Boston Taiwanese Christian Church. John was a bookworm throughout the years he was married to Helen. He left the cares of the household for Helen to handle. Things large and small, there was nothing for him to worry about. During the last few years, as John’s eye sight deteriorated, Helen took over the chore of driving. She had been her husband’s constant helpmate, and was God’s greatest gift of love to him. The couple has three children. The oldest is Jenny (or Mary), followed by two boys, Peter and Richard. All of them finished college in Taiwan before coming to the United States. All three have their own families and achievements. Jenny and her husband John Olsen, and daughter Christina live in Winchester, MA. Peter and his wife Margaret have a son Kevin, and they live in Andover MA. Richard and his wife Judy have two sons, Robert and Andrew, and they are in Lexington, MA. On October 3, 2011, Helen was found lying on the floor at home. There were broken bones. At hospital, the operation itself was a success, but her body was weak and heart was not functioning properly, water quickly accumulated in her lungs, and breathing became nearly impossible. Her doctor gave her only 1% chance of survival, but the good Lord hearkened to our prayers and the danger passed. On October 29, at her rehabilitation center, the family was able to hold a celebration of her 88th birthday. We all remember how jovial she looked and there were wonderful exchanges among us. On November 5, quite unexpectedly she passed away in a peaceful sleep, returning home to the Lord.